DEJAVU RDTA comes with a unique build deck for dual coils building, adjustable side airflow and opened 4-tube bottom airflow for smooth airflow. And the deep juice well offers more space for liquid. 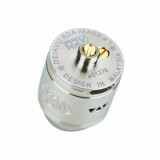 DEJAVU RDA is an innovative rebuildable drip atomizer and a new version after the original DEJAVU RDTA. It comes with a unique build deck for dual coils building, adjustable side airflow and opened 4-tube bottom airflow for smooth airflow. And the deep juice well offers more space for liquid. It also comes with a BF pin for squonking. 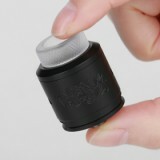 The DJV RDA delivers premium flavor and massive clouds. • You can select more Wire, Tool or other accessories for easy building.